Tom Moody - artwork / blog / old blog / FAQ / music. Tom Moody is an artist and musician based in New York City. His low-tech art made with simple imaging programs, photocopiers, and consumer printers has been exhibited at artMovingProjects, Derek Eller, and Spencer Brownstone galleries in New York as well as other galleries and museums in the US and Europe. 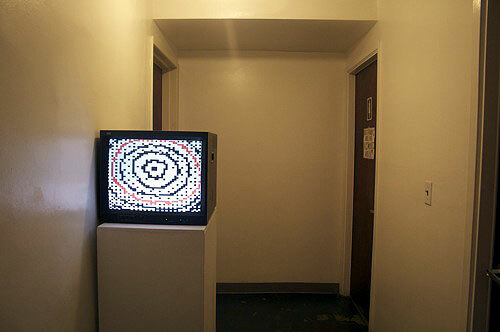 His videos have been screened in the New York Underground Film Festival, Chicago Underground Film Festival, Dallas Film Festival, and other venues, and he and his work appear in the film 8 BIT, which premiered at the Museum of Modern Art in New York. His blog, commenced in February 2001, was recommended in the 2005 Art in America article "Art in the Blogosphere." A CD of his music collaborations with earcon (John Parker), titled Scratch Ambulance, is available on iTunes and at cdbaby.com. Statement. "I'm amused by the lingering rhetoric of futurism -- the Buck Rogers, 'machines-will-change-our-lives' spieling -- that continues to surround digital production in our society. The computer is a tool, not magic, and possesses its own tragicomic limitations as well as offering new means of expression and communication. I am intrigued by the idea of making some kind of advanced art with this apparatus--objects, images, and installations that hold up to prolonged scrutiny in real space. At the same time, I am drawn to 'cyber-kitsch' in all its forms, whether in old programs such as MSPaintbrush, the amateur imagery that abounds on the Web, or the unintended poetry of technical glitches. My work proudly inhabits the 'lo-fi' or 'abject' end of the digital spectrum." Critical writing by TM (including CV).